Chicken thighs get a bad rap, whether it's because they have a reputation as being unhealthy, or simply because they're considered "dark meat." Here are 11 reasons we love cooking, and eating, chicken thighs. Chicken Thighs Provide "Good Fat"
We're putting this one at the top, not because it's the most important, but because so many of the other reasons that we love chicken thighs come down to the fact that they contain more fat than breasts. And if you thought that was a negative, think again! The fat in chicken thighs is monounsaturated, which means it's the so-called "good" fat, lowering your bad LDL cholesterol while raising your good HDL. The same goes for the skin! To prepare crispy-skin chicken thighs, you need bone-in, skin-on thighs. Cook them in a cast-iron skillet over medium heat, with a small amount of oil, skin-side down, until the skin is crispy and golden brown. Then turn them over and transfer the pan to a 375 F oven and cook for another 20 to 30 minutes. Cast iron is handy for this since it's safe in the oven and on the stovetop. To be clear, all protein cells contain the same amount of water. So it's not that thighs contain more "juice" than breasts, but rather, when you cook them, they retain more of that juice than breasts do, in part because of the skin, and in part because of the bone. Chicken thighs also contain more fat and collagen than breasts, producing a more succulent mouth feel when you bite into them, especially when braised. The more intense flavor of chicken thighs compared with breasts is due to the fact that thighs are considered "dark meat," which is inherently more flavorful. They also contain more fat than breasts, and fat is major source of flavor. Not only that, but the bone imparts flavor, especially if you braise the thighs, which helps extract the rich flavors contained in the marrow. Have you ever heard of a boneless drumstick? No, because there's barely enough meat on a drumstick to make the process worthwhile. But thighs, on the other hand, are available bone-in, skin-on, as well as boneless and skinless, and can be cooked in all kinds of ways, like on the grill, the stovetop, baked in the oven, pan-roasted, braised, or simmered, to name just a few. Whether you debone your chicken thighs before cooking or simply save the bones afterward, chicken thighs will contribute a wonderfully rich chicken flavor to your homemade chicken stock. For extra body, try adding wing tips as well, which are almost pure cartilage. This doesn't mean you can leave them on the grill from now until Tuesday. But particularly when prepared using moist-heat cooking techniques like braising, chicken thighs are extremely forgiving. The most that will happen if you braise them for extra time is that the meat will simply fall off the bone. Technically anything can be braised. But because thighs contain a bone, along with connective tissue, like cartilage, at the ends of the bones, along with additional connective tissue around the muscle fibers, due to the extra exercise the thigh muscles perform, braising unlocks a terrific amount of collagen. Through this method of cooking, the collagen breaks down into gelatin, which in turn contributes to the feeling of juiciness when you bite into it. 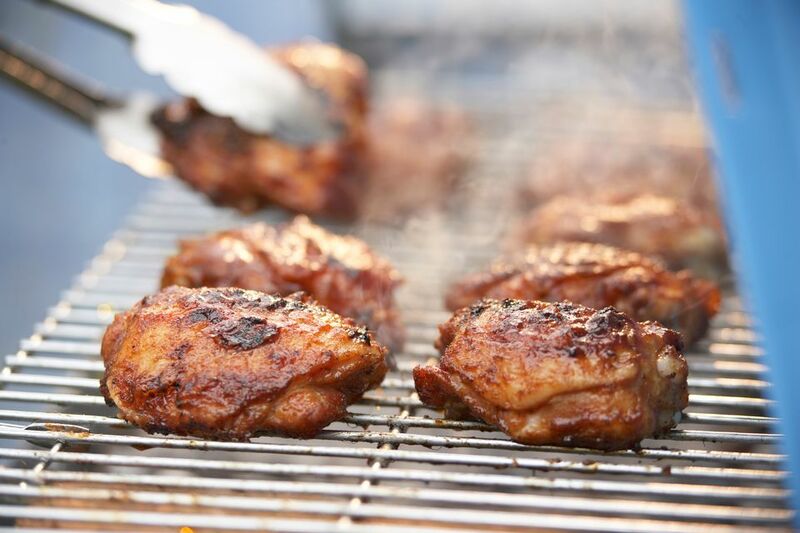 Again, because of the fact that they're naturally juicy and protected by a layer of skin, chicken thighs are ideally suited for cooking on the grill. You can't cook them over high heat like a chicken breast, but cooked over a medium grill, chicken thighs will turn out tender and juicy. For best results, marinate before grilling and brush with sauce near the end of cooking. Chicken thighs boast a very favorable meat-to-bone ratio relative to any other bone-in chicken part. In fact, it's not even close. With a chicken thigh, you can pick it up, take a full bite and not hit bone. Try that with a drumstick or wing and you'll understand why chicken thighs are the ultimate choice when it comes to meatiness. If you happen to enjoy extra flavor, juiciness, and crispy skin, you'll be pleased to learn these features don't actually cost you anything. In fact, quite the opposite. Bone-in chicken thighs on average cost about one-third the price per pound of boneless, skinless chicken breasts. Boneless thighs cost a bit more, but they're still only half to two-thirds as much as boneless, skinless chicken breasts.